Dimensions 38 inches H. x 7.5 inches W.
A Female figure identified with the Mossi. 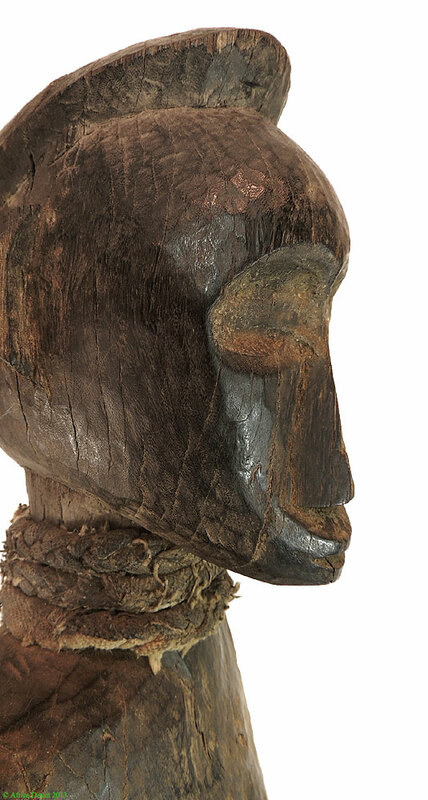 The crested hairstyle known as gyonfo worn by the female is a main Mossi trait on this figure. Figures such as this are identified with local chiefs and clan elders during ceremonies reinforcing local political relationships and chiefly authority. They are also used at funerals and in some areas are buried with the elder. During yearly public ceremonies figures honoring ancestors will have cloths wrapped around their waists similar to cloths worn by Mossi women. This is an impressive figure and would have a prominent place in a collection. The Mossi are today the largest single group living in Burkina Faso. They originated from horsemen who made their way north from present day Ghana during the 1500’s. Mossi are renowned for their masquerades and the use of large superbly sculpted and brightly painted masks and colorful costumes. Among the Mossi elders are highly honored with elaborate funerals and the appearance of masked dancers with masks representing ancestors and various spirits and forces of Nature in dramatic and often vigorous dances. Sculpted figures known as Ninande (pl.) have a number of functions and It is difficult to establish the use of a figure without specific knowledge of its use and function.